Rentals United is a channel management business for the holiday rental market. Located in Stockholm, Sweden, the company — with clients worldwide — exemplifies today’s digital global business. Property suppliers (owners and managers), who have or own holiday properties they wish to rent. Rentals Property suppliers list and market their properties on a multitude of relevant websites of partners and through online sales portals. Online property agents, who can access Rentals United’s inventory of properties, expand their geographical reach and generate more bookings. Rentals United saves time for their clients by automating a substantial part of their daily workload. The service is a “one stop shop”: synchronizing bookings, pricing, and calendar availability all across the web in real time—from a single entry point. The company currently works with 27 partners, is connected with more than 50,000 properties, and transacted €2,296,000 in bookings in 2014 and is growing fast. 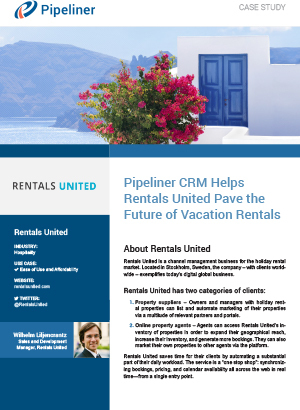 Previous to Pipeliner CRM, Rentals United was using the free version of Sugar CRM, with which they had some issues. “It was a bit complicated to configure, and it did not look very nice visually, so it was quite dull to work with,” Liljencrantz said. Liljencrantz has found Pipeliner CRM extremely easy to deploy and administrate. “Rolling Pipeliner CRM out was easy,” he said. “After only a few hours of initial consulting from the Pipeliner team we were up and running. The system is both user-friendly and intuitive. “The time-consuming part—and what is worth spending some time on—is how to configure the system from the start so that it really corresponds to one’s particular business needs. “The fact is that Pipeliner CRM is now the central work tool in our company. The system is nice to work in, and that makes all the difference,” Liljencrantz concluded. “We now have all the client info in one place, and it is easy to keep track of how we are performing.